Macrium Reflect is a backup, disk imaging and cloning software that come with free, personal and commercial editions. It is a product of Macrium Software, a company established in 2006 whose founder personally experienced data disaster and, not finding practical and easy to use backup tools at that time, developed his own solution. For more than a decade now, Macrium Reflect has established its reputation for its speedy recovery times and the ability to create safe and secure disk image. Macrium Reflect evolved through the years with new features and capabilities to meet the disk imaging and recovery requirements of customers. The software is offered in five editions starting with a basic free edition that was offered from the very start, making the company one of the earliest to release a free version for backup software. It has since proven to be a reliable solution to quickly image and restore an operating system. All other editions are paid solutions for home PC, business-critical workstations, servers and large-scale server systems. Prices are pegged for licenses per PC or server with ascending cost and beefier features as one goes up the tier from personal to business to commercial use. The software is compatible with all Windows operating platforms. Having a free edition is a big attraction. 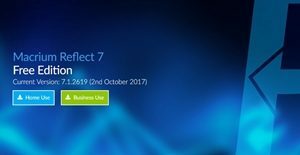 And the good thing is that Macrium Reflect’s free edition is regularly upgraded with additional features (the 7th version was launched early 2017). If you’re looking to back up your system in the fastest, easiest and safest way, then you’ve got a very practical solution that is just a download away. You can upgrade your hard disk, try a new OS, and protect personal files and documents in an easily recoverable backup file that you can save to local, network and USB drives or transfer to DVD format. Macrium applies Rapid Delta technology that increases cloning speeds by copying file system deltas. The same technique is applied in recovering and restoring images in minutes or even seconds. Whatever your need, from simple system or file recovery on your home PC to backing up entire business workstations and servers, Macrium can provide tailor-fit solutions designed for endpoint backups and recovery. Macrium boasts of over 900 resellers of its products worldwide and you can use its partner locator in its website to find a reseller nearest you. Premium products brings with it 24/7 support from an experienced development and support team for any queries and technical issues. If you are considering Macrium Reflect it could also be sensible to check out other subcategories of Best Backup Software gathered in our database of SaaS software reviews. Companies have different needs and requirements and no software solution can be just right in such a scenario. It is pointless to try to find a perfect off-the-shelf software product that meets all your business needs. The intelligent thing to do would be to adapt the system for your specific requirements, employee skill levels, finances, and other elements. For these reasons, do not hurry and invest in well-publicized popular systems. Though these may be widely used, they may not be the ideal fit for your unique requirements. Do your groundwork, check out each short-listed system in detail, read a few Macrium Reflect reviews, speak to the maker for explanations, and finally settle for the application that offers what you need. How Much Does Macrium Reflect Cost? We realize that when you make a decision to buy Backup Software it’s important not only to see how experts evaluate it in their reviews, but also to find out if the real people and companies that buy it are actually satisfied with the product. That’s why we’ve created our behavior-based Customer Satisfaction Algorithm™ that gathers customer reviews, comments and Macrium Reflect reviews across a wide range of social media sites. The data is then presented in an easy to digest form showing how many people had positive and negative experience with Macrium Reflect. With that information at hand you should be equipped to make an informed buying decision that you won’t regret. What are Macrium Reflect pricing details? What integrations are available for Macrium Reflect? The software allows for command line integration which is helpful for advanced users who want to create ad run scripts to automate processes.